As part of a series of protests this week against police brutality and racial injustice, Notre Dame students staged a “die-in” between O’Shaughnessy and DeBartolo Halls at 12:15 Tuesday, lying down on the sidewalk as students in both buildings changed classes. Students and members of the Notre Dame community cover the space in between O’Shaughnessy and DeBartolo Halls in a “die-in” Tuesday, part of a demonstration against police brutality and racial injustice. 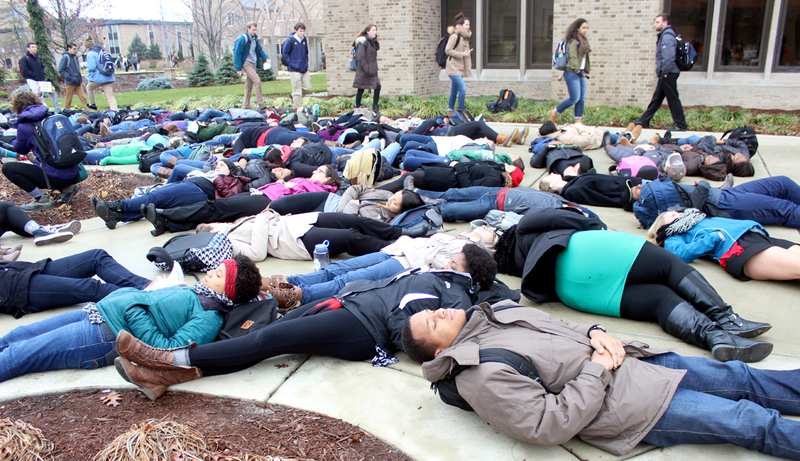 The die-in was part of the All Lives Matter Week to End Racial Injustice organized by the Notre Dame National Association for the Advancement of Colored People (NAACP), the Latino Student Alliance (LSA), the Black Law Student Association (BLSA), the Progressive Student Alliance (PSA) and students in the Masters in Peace Studies program. The events also include a prayer service, another die-in, a roundtable discussion and a public display. The demonstrations come most directly in response to the deaths of Michael Brown and Eric Garner. The week before Thanksgiving break, protests erupted across the country after a grand jury decided not indict Darren Wilson, a white police officer who fatally shot Brown, an unarmed black man, in August in Ferguson, Missouri. Two weeks after the decision in Wilson’s case, more protests broke out when a Staten Island grand jury also did not indict Daniel Pantaleo, the police officer implicated in Garner’s death in July. While a group of officers tried to arrest Garner for selling untaxed cigarettes, Pantaleo put him in a fatal chokehold. In response to these events, NAACP Notre Dame president and senior Niciah Petrovic said she invited representatives of several campus organizations to join a planning committee last week. “We wanted to make sure we gave as many people as possible the opportunity to shape what this week would look like,” she said. Sophomore Xitlaly Estrada, LSA’s social justice chair, said the purpose of the week is to start conversation about the institutional nature of police brutality. Petrovic said the events are also meant to address backlash among Notre Dame students against the national protests. Petrovic said the planning committee decided with a vote to organize the week using the title “All Lives Matter,” instead of “Black Lives Matter,” which is more commonly used nationally, in order to be inclusive of all allies of the movement. All Lives Matter Week began Sunday afternoon at the Grotto, where organizers handed out copies of the Yale Law School BLSA’s statement denouncing the Ferguson grand jury decision and asked for 4.5 minutes of silence, symbolizing the 4.5 hours Brown’s body was left in the street after he died. Petrovic said the group walked to Ryan Hall for a prayer service afterwards. 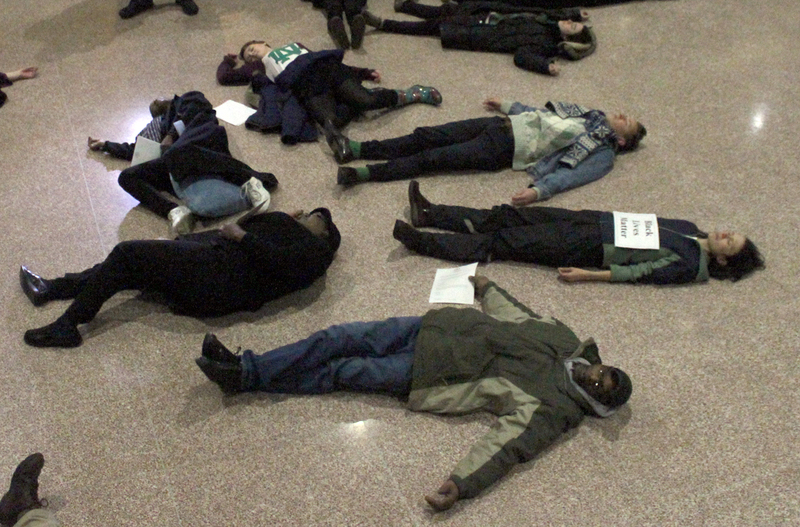 Notre Dame students and South Bend community members “die in” at the South Bend city council building on Monday to protest racism. On Monday, the group set up rides to a die-in and demonstration at the South Bend City Council building, organized by local rapper “Blu” Casey, special education teacher Regina Williams and Gladys Muhammad, associate director of the South Bend Heritage Foundation. Petrovic estimated 25 Notre Dame students attended. She said the group joined with the community organizers in order to show solidarity with South Bend. Small-group discussions in which community members developed action plans followed the die-in at the City Council building, which also lasted 4.5 minutes. Sophomore Jourdyhn Williams, Notre Dame NAACP’s Diversity Council representative, attended the South Bend and Notre Dame die-ins and said her group discussed resurrecting the “I, Too, Am Notre Dame” photo project. “Our group mostly consisted of Notre Dame students,” Williams said. “Our biggest issue was trying to bridge the gap between Notre Dame students and the South Bend community because on campus a lot of people say we’re in our own bubble. Williams said she was glad her community was able to demonstrate in a constructive way. Tuesday’s Notre Dame die-in lasted 11 minutes, symbolizing the 11 times Garner said, “I can’t breathe” before he died. Junior Alex Rice, president of the Africana Studies Club, said she was struck by the number and diversity of people who attended. Wednesday, a dinner and discussion session will take place at Legends at 7:30. Petrovic said the event will be a way to plan for the future. Petrovic said the event will also be an opportunity for people who disagreed with the demonstrations to join the discussion. Thursday, the organizers plan to set up a display between DeBartolo and O’Shaughnessy Halls. Kathryn Lance, a PhD student in the Peace Studies Program, said the week is a way for students to take action in the context of their own environment. Petrovic said she heard racial slurs and curse words during Tuesday’s die-in and saw negative comments on social media sites such as Yik Yak, but she was encouraged by the numbers and diversity of the demonstrators. “We want to make sure, when things like this happen, we feel a sense of community that shows that not just black people are concerned about this,” Petrovic said. “It’s not just Latinos who are concerned about this. If you look at the die-in earlier, there were way more white people than black people.